One of my very favourite things about reading a book is discussing it with friends afterwards… or better yet, during. I loved literature classes at university and I often wonder why I haven’t joined a book club. I love the way other people bring other perspectives to the text, allowing me to see it in a different way. 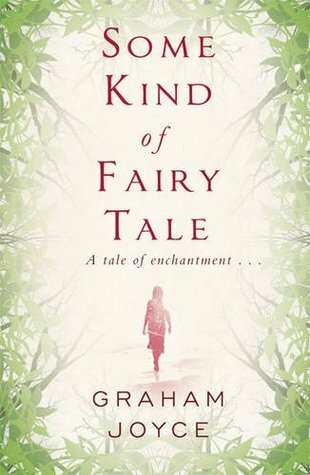 Back in late November, Lynn O’Connacht mentioned in her reading round-up that she’d set down Some Kind of Fairy Tale by Graham Joyce, finding it wasn’t a book she was able to connect with. Since Some Kind of Fairy Tale had been on my wish list for a little while, I immediately went “Ooo… pick me, pick me!” And here we are. Hi, everyone! I’m Lynn, an indie author, a reader, a gamer, and an occasional watcher of dvds. I mostly read and write speculative fiction and then blog about both. I have an MA in English literature, specialising in British fantasy as well as Creative Writing. I love discussing stories, so I was delighted when Elizabeth expressed interest in a discussion of Some Kind of Fairy Tale. I’ve had great fun with it and I hope you’ll enjoy reading our discussion too. This is less of a review than a conversation. It is somewhat spoilery and will probably work best if you’ve read the book. If you haven’t, or you need refreshing, here’s the Amazon description. This conversation also got rather long, so this is only part one. You can find part two over at Lynn’s blog. So with one final warning (SPOILERS BELOW), let me kick things off. Elizabeth: This book gets off to a bit of a bumpy start for me. Peter’s treatment by his parents in Chapter 2 was almost enough for me to put down the book. It felt like they were punishing him because he refused to stick his head in the sand like they were. I think responsibility is going to be a key theme of this book and I can see it being echoed in Ch 3 where Peter tells his son Jack to go and put the rat he killed in the bin. Lynn: I have to admit, though, the way people treat one another, not just Peter’s parents, is one of the things that made me put the book aside. Responsibility does seem to be shaping up as a key theme. It keeps coming back to some form of that so far. Elizabeth: Even the boys’ names have some vague links to fairytale. Like Peter and the Wolf or Jack and the Beanstalk. But maybe I’m reading too much into it. Lynn: I doubt it. It’s one of those stories where everything is about the details from what I’ve seen. Mrs Larwood’s first name is Helen, likely a reference to Helen of Troy, for example. I associated Peter more with Christianity myself, probably because he’s such an opposite to Tara. And Saint Peter, of course, has the keys of heaven in Christian legends. So far in the story it’s been Peter who’s keeping Tara at arm’s lengths from anyone. He’s barring her entry back into her old life and, well, with the stories of what happens to people who return from Faerie combined with the Christian notion that fairies are angels somewhere in between the good angels and the fallen ones… There’s a gate there. Tara can’t pick up her life where it left off, not only because everything is changed, but because Peter won’t let her in. He’s the one who sends her to a psychiatrist. Elizabeth: Excellent point about Peter. I can definitely see what you mean about him being more aligned with Christianity (and I’d been feeling his connection with Peter and the Wolf was far too tenuous). I believe the book explicitly brings up that point you make about fairies being between the good angels and the fallen ones. Lynn: It might. I think I remember seeing it too. *rummage around* There we go. Chapter 15. Right at the top. “These Siths of Fairies they call Sleagh Maith or the Good People … are said to be of middle nature between Man and Angel, as were Daemons thought to be of old”, Reverend Robert Kirk, 1691. It’s not the entire quote, but it’s the bit we’re remembering. It’s not quite our interpretation, as you can see, but it’s similar enough to make note of it. Joyce is clearly aware of the Christian interpretation. Elizabeth: Peter’s oldest daughter, Zoe, also has Christian connections. Zoe’s name is another form of Eve and means ‘life’. I wonder if this is a way to set her up as an echo of Tara. After all, her dating a white rapper sounds rather similar to Tara dating musician Richie. And in fact, the epilogue seems to bear this out. Lynn: I didn’t know that about Zoe’s name! I do agree with you, though. If she’s not an echo of Tara then she’s clearly an echo of Mrs Larwood at least. Of course the women could all be echoes of one another, each in a different stage of life. If we’re to take the third person narrative as a separate character, as we must in the end, and the story it tells as constructed then things are potentially even more complicated. Elizabeth: Leaving aside the third person narrator for now, I definitely think Mrs Larwood, Tara and Zoe gesture towards a cycle, though I haven’t entirely pinned down what kind. Lynn: Neither have I. Something feels a bit off about the age-suggestion I made. Not that I think it’s necessarily wrong, but that it’s not all of the connection. There’s more to it. Elizabeth: The book seems to imply that they were all considered May Queens. That could have something to do with it. The May Queen I think is meant to be the embodiment of youth, beauty and spring. This seems to tie in with the descriptions of Tara’s charisma before she was spirited away, as well as the connection with the bluebells and cherry blossoms. In some versions, the May Queen was offered as human sacrifice. Likewise, though neither Tara nor Mrs Larwood were killed, their old lives were effectively destroyed. Still not sure that pins down the cycle, though. There’s no sense of the destruction paving the way for rebirth. Lynn: Maybe it’s not meant to destroy nor offer rebirth of some kind? We hear about Mrs Larwood’s loss of her husband, Tara’s decision to go back to save Richie and then Zoe being told to turn away the blossom-asker. The situations slowly change over the course of those three lives because of those lives intertwining. Elizabeth: Good point! We see a lot of those lives intertwining, thanks to all the point-of-view changes. These changes were still catching me off guard by the end of Chapter Eight, when I realised this was going to be one of those books where we hear from everyone. I found it an effective way to unsettle the reader in the beginning (appropriate for the story). Then, once we’ve got used to the shifts, it turns into a handy way to show the widespread impact of the events and to emphasise the unreliability of the narrators. Lynn: Yep. I wonder in how far the structure helps to showcase the responsibility theme you mentioned earlier as well. By showing us the impact of the events, as well as sharing the history leading up to it, it’s a good way to show how everyone shares their own bit of responsibility for all that happened. Elizabeth: The book reminds me a bit of Fire and Hemlock by Diana Wynne Jones. I think both try to blur the line between fantasy and reality. Only, I loved F&H and absolutely devoured it. This doesn’t have the magic for me. And I think that’s quite literal in some respects. Everyone seems so cynical. Even Tara is worn out and resigned. F&H had a sense of wonder to it and more genuinely entertained the possibility that the magic was real. Lynn: Good comparison! Although I agree. This book doesn’t have the magic for me and the cynicism and bleakness got wearing. It does pick up a little bit when Tara starts to feel believed, I think, but there’s a… tiredness to the book for me. Even when Tara is supposed to be (yep, I went for that verb) at her most lively and vivacious with the added wonder, magic and sparkle that so often comes with stories of Faerie, there’s… no sense of that for me in her narrative. I wonder if that’s on purpose or just that we’re not meshing too well with the book. Elizabeth: Even when Tara begins to tell her story and is describing the carpet of bluebells, it’s less that it’s magic and more like she is disclaiming responsibility (yep, there’s that word again). As you said, there’s no sense of wonder in her narrative, so I suspect that it’s not just us. Underwood makes these very points in Ch 22. I think any wonder is tainted by the choices she makes. Lynn: Ooooh. I’ll be curious to see how that progresses in the book and whether that comes back as a theme. It’d be an interesting one to see the way wonder and people (possibly people aging) shapes up. Though I think it offers a problematic view on Tara’s abortion. Since that’s when she vanished and has already been made a fairly important point in her disappearance from everyone else’s pov, I’m finding it hard not to consider whether that loss or taint of wonder is related to the abortion. I hope I’m reading too much into that now! Elizabeth: That seems like a reasonable connection to me, though it’s worth noting we never really see Tara in a state of wonder. So perhaps it could be argued that she never had any sense of wonder to lose? Lynn: Could be. She’s seemed pretty down-to-earth in the flashback bits, albeit clearly still young. For part two, please join us at Lynn’s blog where we’ll discuss disenchantment, themes of responsibility and the relationship depicted between science and magic.